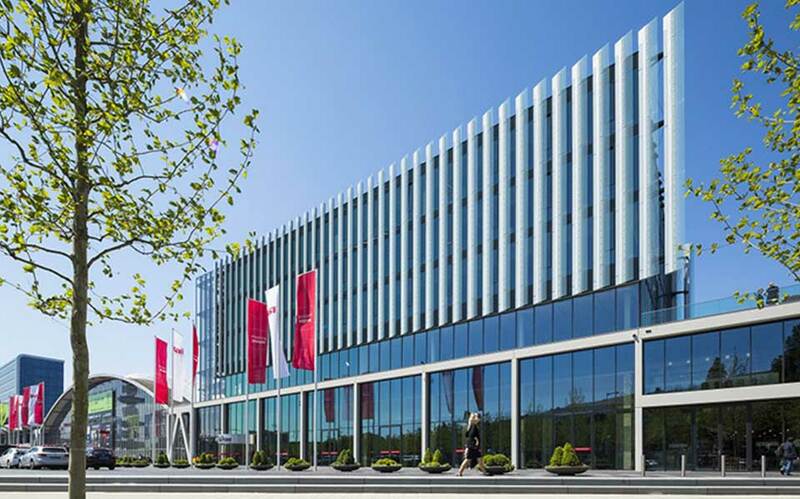 Centrally located within the city of Amsterdam, the RAI Amsterdam Complex is a modern, multi-purpose development that features conference, events and office space. Completed in 2015, the building was designed and constructed as an addition to the RAI Centre, featuring office space, conference facilities, a public restaurant and more facilities. Dutch Architects – Benthem Crouwel Architects, designed the Amtrium specifying the AMG Frameless Glass Balustrade System for internal and external areas of the building. 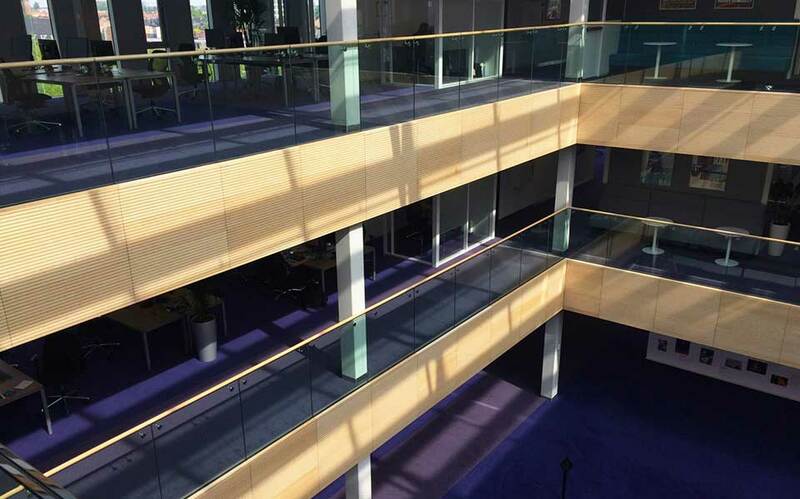 Sustainability was a key factor in the specification of the glass balustrade system supplied by AMG, where the majority of the components are reusable. The glass panels, and stainless steel and aluminium profiles can be reused in a like-for-like manner with almost no degradation of the materials. The rubber gaskets can be reused in a recycled form, and often makes rubber playground tiles or similar products. Another key factor in the specification of the frameless glass system was AMG’s compliance with Building Regulations and Environmental Certificates – notably REACH and ISO 14001:2004. The company also complies with Management Control Certificate ISO 9001, which ensures minimal impact on the environment during the manufacturing process. A total of 100m (0.8kN/m) 10.10.4 laminated tempered glass in a 21.5mm thickness was used in internal balcony areas of The Amtrium. 103m (3.0kN/m) was designed and installed around lower level areas and internal staircases. 91m (3.0kN/m) was specified around external areas of the building, particularly the roof terrace in the restaurant. The interior balustrading features ash wood handrails, and the external railings uses a brushed stainless-steel U-profile. Interestingly, the Inox railing supports are glued directly onto the glass with transparent UV-glue and flat adapters. This means there is no requirement for drilling holes in the glass, helping to create a sleek and seamless appearance. AMG tested the strength of the glued joint on the glass in-house and it was incredibly strong. The stainless-steel threaded end in the rosette bent at a high weight, but the glued joint stayed intact. Proving the AMG Frameless Glass System is incredibly durable while providing aesthetically striking glass railings, maximising light and transparency in internal and external areas. The AMG Frameless Glass System complies with various regulations across Europe, including Nederlands Bouwbesluit 2012, French CSTB of the Centre Scientifique et Technique du Bâtiment, German AbP: ‘Allgemeines bauaufsichtliches Prüfzeugnis’ (AbP is a German abbreviation for “General Building Codes Test Certificate”). AMG have tested the system according to UK Building Regulations BS 6180:2011 Barriers in and about Buildings, in close collaboration with its sole distributor Balustrade Components UK. 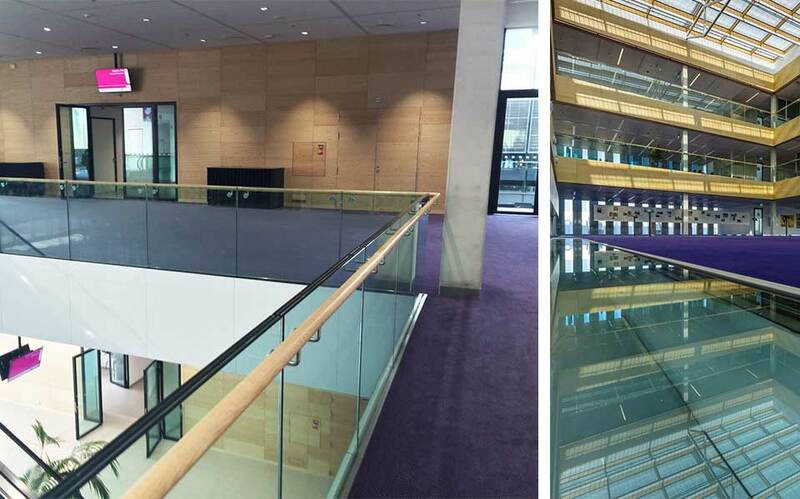 The AMG Frameless Glass Railings are exclusively distributed in the UK by Balustrade Components UK. With over 30 years’ experience in glass fixing accessories and balustrade components, their professional team guides architects, specifiers, housing developers and other industry professionals through every stage of the project specification process, incorporating high quality balustrading into residential, commercial and industrial projects.